Sony Artisan Robert Evans is a wedding and event photographer with a client list that includes not only big-name celebrities such as Tom Cruise and Brad Pitt, but also superstar corporate clients like Google. 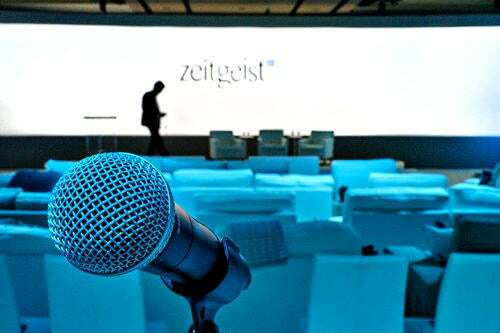 For the last two years, the search giant has employed Evans to document its annual Zeitgeist event—an intimate gathering of great thinkers and business leaders from all over the world. We asked Evans to tell us about how he approaches the challenging three-day shoot, and how his Sony kit has become integral to the process. Alpha Universe: What is Google Zeitgeist? Robert Evans: It’s basically Google’s version of TED. They invite really intriguing speakers from different genres of work and society, from celebrities to past presidents to scientists and doctors and humanitarians and astronauts...you name it. And unlike a TED talk, the talks aren't limited to a set length of time. They could be 30 minutes, they can be 15 minutes, they can be an hour. It’s an annual thing. I’ve shot it for the last two years, and hopefully I will again this year. There are also other events around Zeitgeist: there’s golf, there’s yoga, there are two evenings of parties...things like that. Plus we shoot all the décor. In addition to the room where the talks and presentations are given, there’s also an outside area they call the sandbox. It's made up of different technology Google wants to feature like Google Glass for example. Alpha Universe: It seems like it would be a really interesting gig—an opportunity to learn from some of the world’s best and brightest? 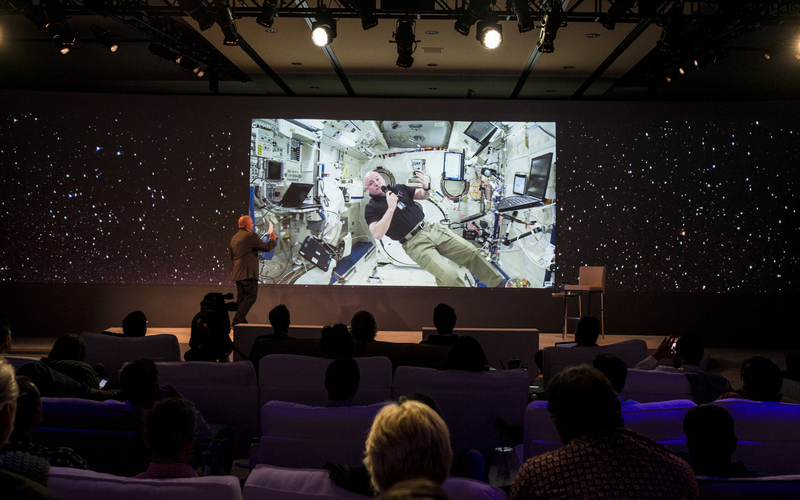 Robert Evans: Last year they had two brothers who are astronauts, Scott and Mark Kelly. They did a live Q&A at Zeitgeist, where one of the brothers was on the stage in the room and then the other brother was on the space station and they let people in the audience ask questions. It was very cool to see that. The year before there were two former presidents speaking—Clinton and Carter—there are entrepreneurs that are incredibly interesting. A woman from Penn State developed technology that will charge your phones and anything else that's rechargeable just while you're walking through the house. It transmits electricity through ultrasound waves, and she figured out how to make that work when people told her it wasn't possible. It’s really interesting getting to see people and learn about things like that. Alpha Universe: What sort of guidance did they give you at the start of the assignment? Robert Evans: One of the things that they asked about right away was regarding noise when photographing. They said when you photograph the speakers, they don’t want to hear the cameras. It’s too loud; it really irritates Larry [Page]. 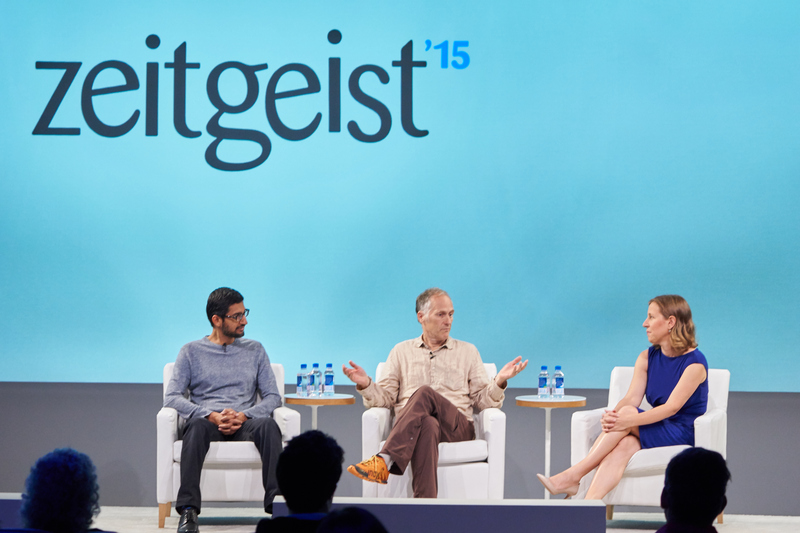 All the Google executives are in there, and the people who attend Zeitgeist are generally the top CEOs from different companies across the world. So the first year I shot it with my α6000, because it’s quiet in general, but it didn’t have a completely silent shutter. And of course now several Sony cameras do have silent shutters, so I can take pictures and not make any noise at all. Even when I used the α6000, it was quiet enough they said they didn’t notice the cameras. I try to be discreet and get my shot and get out of there. Alpha Universe: I understand your work has appeared as part of a Zeitgeist presentation as well? Robert Evans: One thing they asked me to do last year was for the very front screen. They use about 20 projectors to make it work—it’s about 20, $30,000 projectors that are rear projecting—it’s 90 feet long by about 15 feet high, and they asked me to create some content for it. 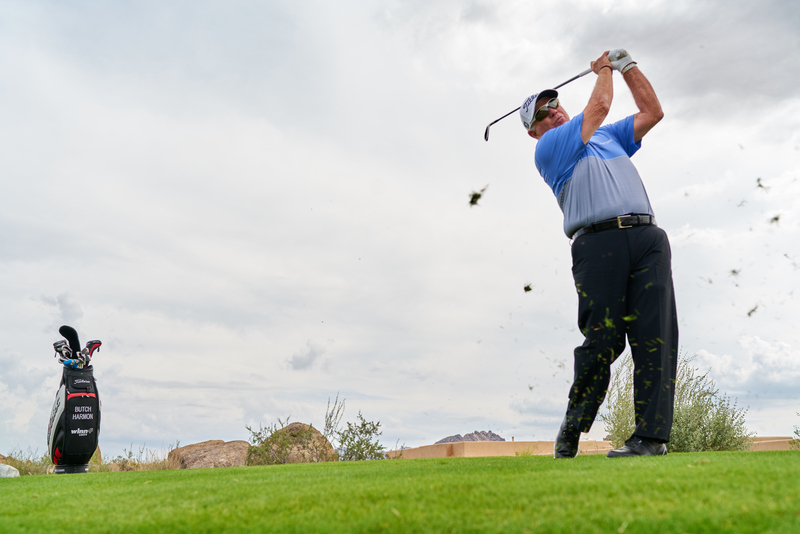 For one of the speakers, the golfer Butch Harmon, they said, ‘We don’t have anything for Butch.’ I photographed golf for them the day before everything started anyway, and they asked, ‘Will you shoot some images of Butch that we can use?’ I said sure, and I shot a a variety of photos. 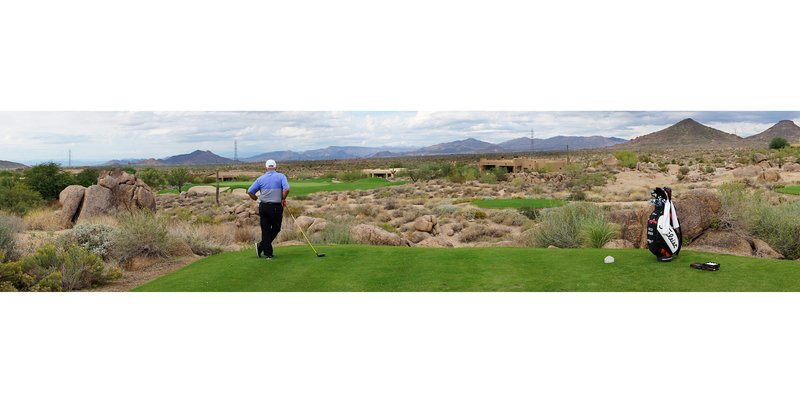 For one of the photographs, I was below him when he was on a raised tee box and I had him tee off right over my head. I got a nice action shot of that. Funny story: The first time that he did it, when he teed off over my head, he hit a hole-in-one. That was kind of awesome. I did a panorama of Butch using the α7R II and its Sweep Panorama feature. I did three of them as part of the images that I submitted. Google loved it, and they didn’t have to do anything to them. 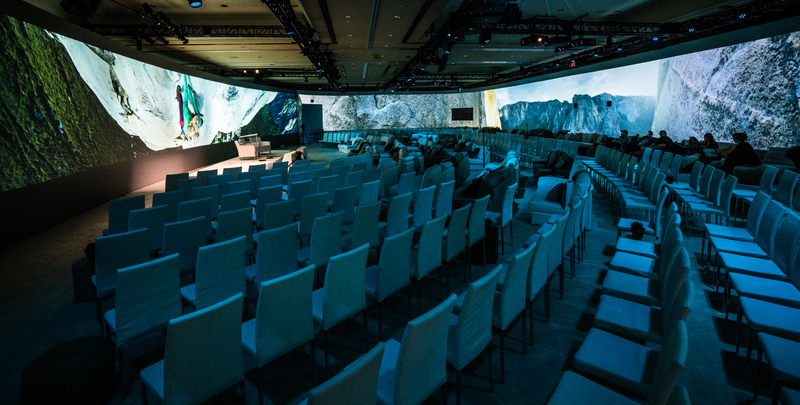 It took me only about five minutes at the most—maybe not even that long—to create three panoramas, and they could get them right up on the projectors. This panorama image right out of the camera was 90 feet long and it looked amazing! They asked, ‘How did you do that?’ I said it just took a few minutes, straight out of the camera. Alpha Universe: For people who may not be familiar with the feature, it works by literally moving the camera during the exposure. Robert Evans: There’s a little arrow and you hold the shutter down and just move the camera to cover the area. All of my Sony cameras can do it. I often send the images right to my phone with the camera’s Wi-Fi and then right out to social media. When I started using Sweep Panorama, people would ask, ‘How did you get that picture with your phone?’ because I’d put it right up on Instagram. I wouldn’t say anything. I did use a hashtag to hint at it—I called it #hotoffthesensor. I would only use that hashtag when I would literally shoot it, send it to my phone and send it out within the first minute or two. Alpha Universe: That’s a great example of technology making life better and easier for a photographer. Robert Evans: To me, that’s the story. It took me all of two minutes to create that panorama, and it went straight out of the camera onto a 90-foot wide screen for Google and they loved it.